The Dharma Center of Drepung Gomang Center for Engaging Compassion / Tashi Gomang Dharma Center provides teachings, retreats, rituals, and ceremonies in the Tibetan Buddhist tradition. The Compassion Education Center of DGCEC / TGDC provides opportunities to learn engaged compassion, take steps toward a peace-filled mind, experience deeper kindness, tolerance and nonviolence in our personal lives, and to enter into intentional care for all in the world around us. We become whole and healthy people, more fully human, when we expand our inner self, train our mind to be calm, and by cultivating a compassionate, altruistic life attitude. This path transcends religious traditions and cultural differences. When His Holiness the 14th Dalai Lama blessed the center on May 19, 2013, he challenged us to expand to a center of education that teaches universal human values – “secular ethics” as he calls it – which is the philosophy of compassion from a non-religious perspective. This provides the foundation of his formula for world peace: compassionate engagement, altruistic living, and fostering interfaith understanding. Your kind donation makes it possible for the everyday operation of DGCEC/TGDC. As a 501(c)(3) organization, all financial donations are tax deductible. 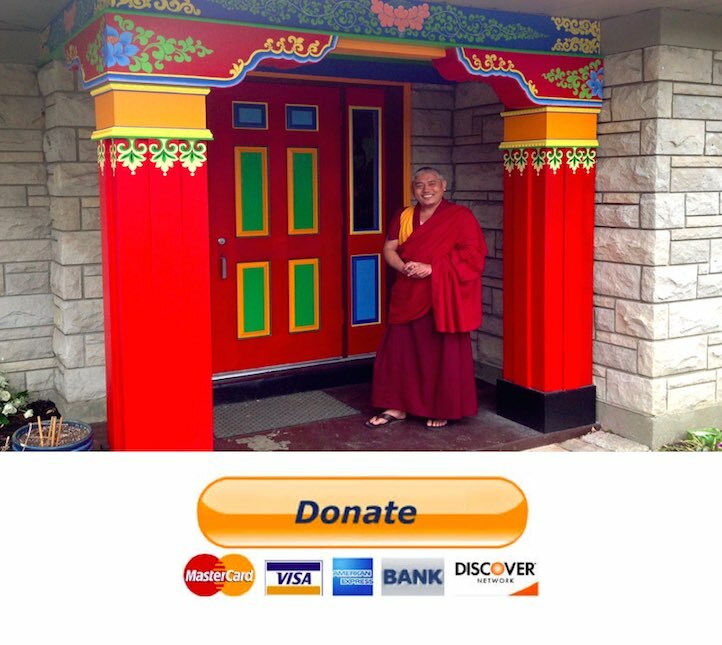 Please make checks payable to “Drepung Gomang Institute” or “DGI” (our incorporation name) and mail to the center or leave in the donation box located outside the shrine room. It is an honored tradition for students to offer donations to their teachers as well. And while such gifts given to the Geshes are not tax deductible, they are deeply appreciated to help with personal expenses. Donations of fruit or flowers are always welcome for our Shrine Room. Gifts of food, toilet paper, eco-friendly cleaning supplies and other items noted in our newsletter are deeply appreciated as well. PLEASE NOTE: In an intentional effort to care for our Planet Home, we use cloth napkins, washable cups, utensils, and plates. Therefore, we do not need throw-away items or bottled water. Other in-kind donations may be welcome as well, but please inquire about need before donating items. Nearly 2000 monks live, work and study at Drepung Gomang Monastic University. Most escaped from Tibet and consider India their adopted home. They are committed to preserving the precious Tibetan Buddhist teachings, their culture and way of life through study, teaching and spiritual practice. In addition to monastic practice, the monks grow crops, staff a local medical clinic, create handicrafts and help care for the Tibetan communities that surround them.